A sinister maze lies beneath the wreckage left by a litany of wars that has plagued Afghanistan since 1978 – the Soviet invasion and struggle with the mujahideen fighters that lasted until 1989, followed by the years of civil war between various mujahideen groups and political factions including the emerging Taliban until 1996, and then the 5-year rule of the Taliban from 1996-2001 to the unending 17 year-long war that the Americans have waged and continue to fight in Afghanistan in their hopes to topple the Taliban and quash their ever-proliferating terrorist cells. It is the longest-running war the Americans have ever engaged in. But long after the sounds of gunfire and smell of smoke have dissipated, it is the lucrative network of drug-trafficking and opium-generating business that lives on (and kills on)… This illicit economy has on many occasions helped to fund the war for its various parties, enemies, and allies involved (whatever we like to call them). As frustrating as it sounds, every meddler in this unending multi-faceted conflict has had one common thread interweaved in their shady patchwork: that is (you guessed it) the notorious opium trade. Whether they are the Russians, the fractious Afghan mujahideen, the Afghan Communists, the Americans, the various Islamist groups inside and outside Afghanistan, the Taliban, the Pakistanis, the Iranians, and God knows who else, they have all had a grimy hand in it. Fariba Fawa, the author of Opium Nation, reports that as the drugs travel across every border beyond Afghanistan, its price increases. A kilo of heroin, a processed extract of opium that sells for $3,000 in Afghanistan, can finally sell for more than $50,000 when it enters the United States. It should make one shudder in disbelief and simmering anger that one of the toughest demons to drive out remains the same one all over the world that ravishes and robs the life out of those who succumb to the bane of drugs like heroin. The thing that makes you even more grieved and angry at the same time is that the majority of these addicts and relatives of addicts are most likely unwilling slaves sold to this sly devourer. They are mothers who lose their sons or husbands to the narcotic; they are sisters who are sold as opium brides to pay for the debts of their brothers or fathers; they are children born addicted to the drug because their mother was forced into taking it; they are husbands and uncles who get involved in the business because they have no other form of employment. Then there are those who offer and trade it, raising and lowering prices to alter and create demand for it where and when it profits them, making sure the right (vulnerable) populations are enticed by it or forced into producing it for lack of any other options. In the case of Afghanistan, the years of war coupled with the wrong kind of agricultural aid projects advocated in the 1950s that eroded Afghan soil, left only a few crops that were possible for farming. It included poppy, the most gainful crop of them all. 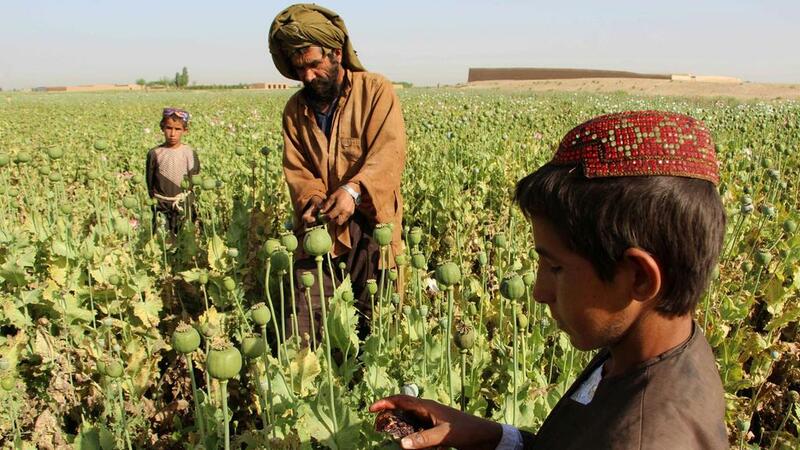 It was in the 1980s that poppy farming spread across Afghanistan – in the Nangarhar, Badakhshan and Balkh provinces – and which led to the processing of opium into heroin and its trafficking all through the 1990s, firstly by the mujahideen and afterwards the Taliban. The Soviets and Americans all knowingly profited from this and allowed for various faces of the opium network to operate, for their own reasons and gains. When the Russians left, the mujahideen groups and later the Taliban carried on reaping the ongoing profits. An estimated fifteen million addicts around the world are supplied with Afghan opium and the drug kills one hundred thousand people a year. Approximately 6.4 percent of the country’s population is engaged in the drug trafficking chain. 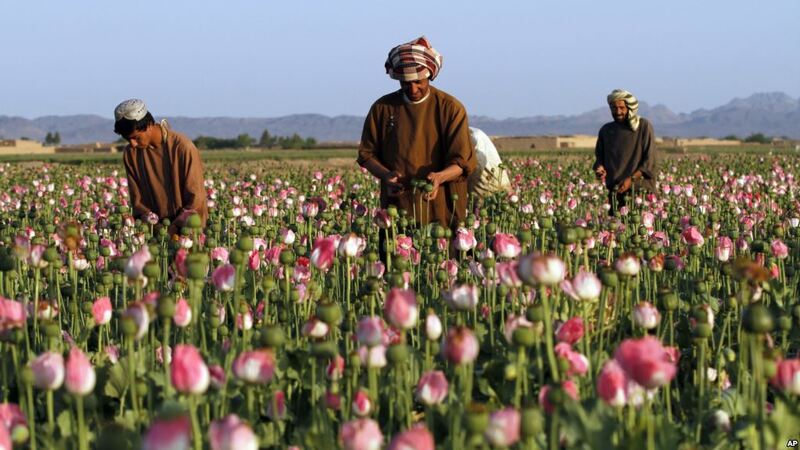 The global trade in Afghan opiates is annually worth an estimated 65 billion dollars. One’s mind is no doubt seared by such statistics, because we cannot even begin to comprehend the human tragedy and untold casualties that play out behind the tidy round-up figures. Whether or not you believe that the devil is real, these numbers paint a seemingly hopeless scenario that should make one wonder… if the devil is real, he’s a smart villain who gets greedy, misled, deceived humans focused on petty things like money, fame, religion, politics, and wars, so that he can do his real work through these corrupted systemic structures that incubate vices and addictions which destroy far many more people in the long term than guns and bombs will in split seconds. Some people will call me a religious person, but I simply see myself as a created soul who has encountered the presence, love and truth of God through the lived message of Jesus. He has defined specific moments of my life that I can recount in detail and that I continually experience in the daily grind of ordinary living. Therefore, to live by his words and his spirit is not a religious thing for me, but a spiritual-physical-supernatural life of relationship and interaction that involves all my heart, mind, body and spirit. In the tangible, and the spiritual. In the seen and the invisible. God is not up there in the clouds. He sits and suffers with us, as in the life, death, and resurrection of Jesus. That is the hope I have experienced, and tangibly felt – so much so that it does not clash with logic, but rather logic complements it; so much so that it is not a religious obligation, but a joy of knowing Him and making Him known by loving my fellow man as He loves him. I see in the opium trade all the ugliness of man’s depravity, a lost humanity devoid of the true experiential knowledge and love of God in his heart. Suffering and evil does not make me rail against Him, rather it makes me run to Him, because He gives me strength to love the addict and the warlord, to seek justice, to pray and work and act for their freedom and repentance (the word simply means to “turn around”, to “express in intensive force”). In recognizing man’s depravity, we can see the real possibility for the goodness that he was made to embody and the promise of restoration. In his depravity, without the love of God and man, he destroys others by his greed; he allows evil and the enemy of our souls to invade his home, his society; he thinks he has free will, but really, he has become a slave to something he cannot master. He does not know the words of Jesus, who said, “The devil comes to steal, kill and destroy; but I have come that they may have life, and life abundantly.” He doesn’t know the two greatest commandments that Jesus lived and shared, “Love God with all your heart, mind, soul and strength; and love your neighbor as you love yourself.” He has not yet comprehended the power of Jesus’ message of forgiveness and peace-making through self-sacrifice: to “love your enemies and pray for those who persecute you” and to be “peacemakers, for you will be called sons of God”. I write all of this with utmost conviction. To my dear reader: in order to see the transformation and redemption of a person, a family, a community, a tribe, a society, a nation, we must realize not only the wrongs that others have committed against us, but the wrongs that we have committed against others. We must realize how love has often left our hearts, and we have been selfish to the core. We must realize where we have gone wrong, as individuals, and as a collective. We must weep for all the times we were silent about an injustice we should have spoken up about. We must understand that evils such as the world’s opium trade, its bloody conflicts, the endless cycles of political strife and corruption, the sexual perversion, the crimes against humanity, the genocides and racial wars, are all merely revealing consequences of a deeper root issue. That is, our rebellion against the Truth, our hatred against Love, our refusal to live by the way of self-giving sacrifice, our orphan spirit and false identities, our shame and self-righteousness apart from the grace of God… I can go on, but if you look past the masks that every person wears, whether they are born into circumstances that make them rich or poor, clean or dirty, educated or illiterate; whether they are politician or pauper, warlord or addict, orphan or prince, factory worker or businessman; you will see the same lost child in each one, and an unspoken desire for forgiveness, wholeness, and redemption. The hidden war is the one that is waged for our very souls. When we start there, we will soon be able to make the external changes by way of education, policy, law, medicine, technology, arts, government, business and whatever spheres of influence we were uniquely created to impact. There’s that story about the man who wanted to ask God, “Why aren’t you doing anything about the suffering and evil in the world?” But he was afraid that if he did, God would ask the same question of him. The greatest defeat is to be ignorant of the real battle. To win it is to be set free from the tyranny of dictators, religious extremism, political ideologies, human philosophies, temporary pleasures, you name it all. To be liberated is to overcome fear, disgrace, and hatred with Love. To encounter Love is to know our Creator in the very present moment, and to know and feel that He knows us by name. Knowing Him – not just following religion or what other people tell you – is the very power that enables us to love those who hurt us, to care for those who cannot repay us, to do as He did, and as He does.